It is the end of the week and I have been enjoying BLT sandwiches in various forms all week and it was time to change things up a bit. I still had some field tomatoes, lettuce and bacon in the fridge however that needed to be finished. With the lettuce and tomatoes already there it was not too much of a leap to think about a salad and bacon always goes well in salads. But, with just tomatoes, lettuce and bacon the salad would have been pretty boring and then I thought of the BLAT that adds avocado to the BLT and since I had one on hand a diced avocado was the next thing to go onto the salad. I like the pungency that onions add to salads so I added some chopped red onions. A BLT just wouldn’t be complete without some mayo and I was wondering how I could work some into the salad and then it hit me, a blue dressing made with mayo would be perfect. I used my blue cheese dip recipe replacing the sour cream with buttermilk to thin it out a bit to make it more dressing like. As many salads are this one was easy to throw together and it hit the spot! 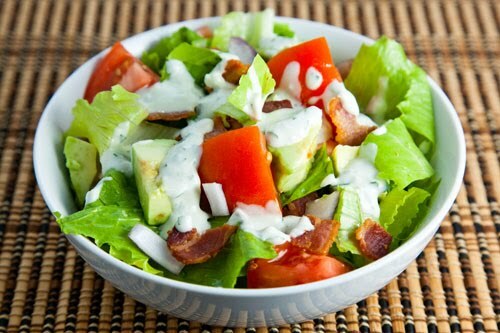 The juicy tomatoes and creamy avocado went really well with the salty bacon and tangy blue cheese dressing. Assemble salad and toss with dressing to coat. A delicious change from the usual BLT. And blue cheese is the perfect dressing. Adding avocado is pretty tasty too. Now this is putting a healthy touch to the BLT. Love it!! Two thumbs way up!! I love the addition of the avocado. great site for recipes. I am wondering if you have a recipe for a fattoush salad. It is a lebanese salad that I am crazy about. There is I believe a spice called sumac that goes in it. Are there any lebanese food stores in toronto? Love anything that has bacon in it. Delicious. i love blue cheese and i am salivating just thinking about this salad – a big ole yum! I love that dressing! your salad look really good! What a wonderful blog. BJ sent me. I will spend some time looking around later today. OMG. You are amazing. BJ from Sweet Nothings sent me over to visit. This looks so delicious and fresh, not to mention the great combo of flavors. Hi, Kevin…I featured your blog today….NOT that you are in need of followers (*sigh) but I wanted my readers to see what a great cook you are….and…BLT's are and have always been, my very favorite sandwiches in the whole world !! I found you on BJ's blog…glad I did.I've had a stroll through your blog,and I'll be doing up some of your dishes.The BLT salad sound's really good,Its hard to make a desent salad! Mouthwatering Kevin. I just ate breakfast and could easily devour this for seconds! Wow…this salad looks really yummy! Fresh and delicious. That looks so inviting, fresh and vibrant. I could dive right in.